Canoeing, farm tours, nature walks and rock climbing are just a few of the reasonably priced activities available to schools, youth clubs and organizations, and community groups. All programs are led by Park System recreation professionals trained to provide a safe, enjoyable and education experience. Many of our offerings make great class trips. Download our Release Form (pdf). Group camping is available to chartered organizations at the Nomoco Group Campground, Turkey Swamp Park, Freehold. Tent and platform tent camping is available from April 1 through the second weekend in November. There are six group campsites to choose from, depending on your requirements, and each accommodates up to 40 people. Call 732-462-7286 for more information on Group Camping at Turkey Swamp Park. Discover and develop our creative abilities with a group art class. Classes are offered at the Creative Arts Center in Thompson Park, Lincroft and at Dorbrook Recreation Area in Colts Neck. This historic district features an operating 19th century grist mill, the elegant Waln family home (1774), a carriage house, and an assortment of outbuildings. Offerings include a guided site tour of the grounds, learning about the mill, a tour of the wetlands, short hands-on craft experiences, and an introduction to Historic Walnford in your classroom or meeting place. Call 609-259-6275 for more information on Historic Walnford. Deep Cut Gardens on Red Hill Rd. 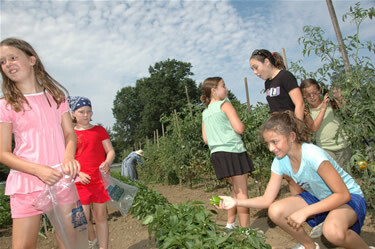 in Middletown is a facility dedicated to the home gardener. Programs on plant propagation, pruning, planning your garden, or other garden-related topics can be arranged for youth groups such as Boy Scouts and Girl Scouts. The types of programs offered will depend on the interests of the group and seasonal availability of horticultural supplies. Call 732-671-6050 for information about prices and availability. All ages can experience New Jersey's nature and history hands-on with nature walks, lectures, group discovery activities, Native American lifestyles and marine science programs available at the group's location or a county park. Some programs are designed specifically for the Manasquan Reservoir Environmental Center. For programs at the Manasquan Reservoir Environmental Center, please call 732-751-9453. For nature programs at other parks, please call 732-872-7369. Longstreet Farm is the Park System's 1890's living history farm. Fun and learning for everyone, especially the little ones, can be found here. Take a guided farm tour to absorb the history of the 1890's, 'talk with the animals' on the Barnyard Adventure, walk in a farmer's shoes for a day, go for a wagon ride, eat a hearty farm breakfast, and learn about all of agricultural Monmouth County at the turn of the century. Call 732-946-3758 for more information on Longstreet Farm in Holmdel. Experience fun adventures with the Park System. In the spring and fall, enhance your group's teamwork with an Outdoor Adventure Challenge; learn skills such as canoeing, bicycling, hiking, rock climbing, and cross country skiing; or try samplers that engage your group in multiple activities. Call 732-842-4000 ext. 4240 for more information on Outdoor Recreation. Find a beautiful setting for group picnics at Turkey Swamp Park in Freehold. The Sandy Run Area can be reserved for a fee. The Deer Trail and Oak Point areas are available free on a first come, first served basis. In addition to Turkey Swamp Park there are picnic areas in Holmdel Park (Holmdel), Shark River Park (Neptune & Wall), and Thompson Park (Middletown) . All groups of 50 or more must obtain a program receipt at least 7 days prior to the proposed picnic date. Call 732-842-4000, ext 1 for an application or more information on Group Picnics. Attention Scout Leaders! Many Park System group activities fill certain badge or "try-it" requirements. Please call the phone number listed next to the activity for more information. The Sunnyside Equestrian Center is where Park System equestrian programs are held. Limited group programs are available. Please call 732-224-1367, ext. 1 for rates and scheduling. Spray & Play is a program available to organized groups serving individuals with disabilities in Monmouth County. Enjoy time in the Sprayground (located in Dorbrook Recreation Area) with lots of wet and wacky excitement. The Sprayground combines water fun with the safety of a cushioned surface. A few steps away is Challenger Place, a boundless playground designed for children for all abilities. Please call 732-460-1167 for availability. For prices and more detailed information, please call the telephone listed with the activity information. Park staff can answer all program questions.Group activities are open to people outside of Monmouth County as well as county residents. ALL ACTIVITIES REQUIRE ADVANCE REGISTRATION AND MANY PROGRAMS SELL OUT QUICKLY, SO PLEASE SIGN UP EARLY. The Therapeutic Recreation Division works with other divisions within the Park System to adapt and modify group activities to better meet the needs of people with disabilities. Please call for more information. The Park System's Recreation Assistance Program (RAP) works with non-profit/social service agencies and local towns to provide reduced or no cost recreational programs for county residents/groups with demonstrated financial need. RAP programs are currently offered at community center, schools and other facilities as well in the county parks. Offered in affiliation with SPUR, a therapeutic riding program partner, these lessons offer an opportunity for persons with disabilities to participate in therapeutic riding. Participants must complete an application. Sitting stability is required. Groups age 4 and up with disabilities. Please call for more information. For persons with hearing impairment, the TTY/TDD number is 711.